By Alex White- Hosted by The Guardian. This guest blog by The Wilderness Society’s Amelia Young highlights the campaign by supporters of the miraculous Leadbeater’s Possum to stop the logging of its last remaining habitat. It may surprise many that logging of high conservation value, old-growth forests continues in Australia. In the state of Victoria, areas of pristine forest are marked to be clearfelled, despite the presence of a plantation forestry industry. This guest blog by The Wilderness Society’s Amelia Young highlights the campaign by supporters of the miraculous Leadbeater’s Possum to stop the logging of the last remaining habitat of the little possum. The Leadbeater’s Possum is endangered, and continued logging of its home in Victoria, as Amelia explains, threatens this species with extinction. Note: I am a member of the committee of management of The Wilderness Society (Victoria). Each state and territory of Australia has a state faunal emblem, an animal mascot that represents the state’s unique native wildlife. Queensland has the Koala, West Australia the Numbat. Tasmania could have had the infamous Tasmanian Tiger, until it was hunted to extinction. Today the Tasmanian Devil is the island state’s animal emblem. Here in Victoria, the tiny Leadbeater’s Possum was thought extinct until it was rediscovered near Marysville in 1961. This chance sighting was considered so miraculous the animal was chosen as Victoria’s faunal emblem. The Leadbeater’s Possum lives in the tall eucalypt forests of the Central Highlands, and is found nowhere else on Earth. Today only a few thousand Leadbeater’s Possums remain in the wild. In June the state government established an advisory group to try to address the plight of the possum while, incongruously, maintaining logging in state forests. The state government’s Leadbeater’s Possum Advisory Group is now deliberating as to how to assist the recovery of the state’s critically endangered animal emblem. Recommendations are due by Christmas. Meanwhile, logging in Leadbeater’s Possum habitat in state forests continues. This weekend, brave, young conservationist, Hannah Patchett, 20, has taken up residence in a tiny, red treehouse, measuring 14 square metres). Suspended 50 metres above the ground from a towering Mountain Ash tree, the Little Red Toolangi Treehouse stands sentinel in the Toolangi state forest, just 60 kilometres from the heart of Melbourne. The view from the Treehouse is at once impressive and sobering: rolling, forested hills, rainforest gullies, and the pockmarks of clearfell logging coupes. From her treetop perch, Hannah is calling for an end to clearfell logging in forests known to contain Leadbeater’s Possum. Her plea for the state government to take real action to rescue the Leadbeater’s Possum from extinction echoes the findings of thirty years of research by global expert on the species, Professor David Lindenmayer. Professor Lindenmayer has set out the steps that need to be taken to rescue the Leadbeater’s Possum, and is calling for an end to clearfell logging by December 2013. He has provided a new suite of improved forest management prescriptions to government and forest managers. Professor Lindenmayer’s peer-reviewed science, shows that populations of the Leadbeater’s Possum are in decline due to the loss of forest habitat. Published in eminent journals worldwide, it shows that that bushfires change the forest landscape. It’s also abundantly clear, that clearfell logging alters the forest landscape. It removes trees with hollows, and removes those trees that should be left standing to form the future habitat for the Leadbeater’s Possum and other wildlife which rely on tree hollows to nest and breed in. In the forests of the Central Highlands, the loss of hollow bearing trees has reached crisis point. Yet standing, green, unburnt forests that have survived tragic bushfire events are still targeted for logging. However in this case, perhaps it’s a $61 million dollar question. $61 million is the amount of money Victorians are owed in dividends for the logging of publicly-owned state forests. Each year, state government logging agency, VicForests, is supposed to pay the people of Victoria a dividend for utilising this valuable public asset. Last week conservationists ‘invoiced’ VicForests for $61 million unpaid dividends, based on a 15-20 percent return on equity. After 40 years of clearfelling, and nine years of VicForests’ operations, clearfell logging is not making good for the people of Victoria. State forest logging is costing taxpayers money, and has set our animal emblem on an extinction trajectory. In October, at a public event in the heart of Melbourne, CEO of Zoos Victoria, Jenny Gray, played the recording of the sonar calls of the last Christmas Island Pipistrelle Bat. Hushed and shocked, the crowd listened to the sound of extinction. In the Toolangi state forest, the Leadbeater’s Possum persists. Yet the state government continues to allow logging in areas known to be home to this tiny animal. It beggars belief that in the twenty-first century, in a wealthy developed nation such as ours, a state government has not stopped this logging, despite expert recommendations that the industry be removed from Leadbeater’s Possum habitat. 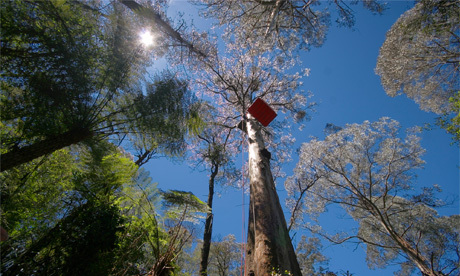 A bright red beacon in the tall trees of Toolangi, the Little Red Toolangi Treehouse stands symbolic of the extinction emergency that is occurring in the forests on Melbourne’s eastern fringe. In the countdown to Christmas, the government’s Leadbeater’s Possum Advisory Group will prepare its recommendations for the forestry and environment Ministers. The fate of the Leadbeater’s Possum hangs in the balance, and from her treetop view, Hannah has begun the countdown for an end to clearfell logging in the animal’s forest home. Amelia Young is the Victorian campaign manager for The Wilderness Society. No Replies to "The story of the little red Toolangi Treehouse"